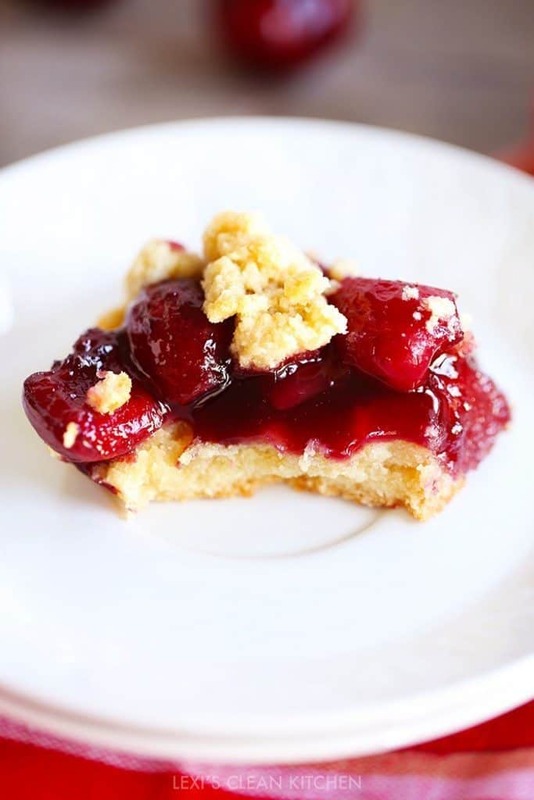 These cherry pie bars are gluten-free, grain-free, and the ultimate summer dessert! All Summer our fridge is stocked with cherries. I mean, aren’t they just the BEST!? 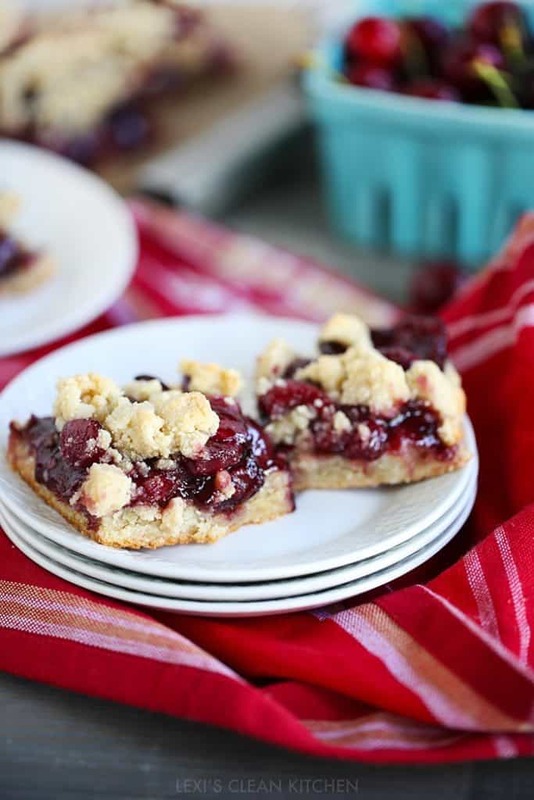 I made these cherry bars twice last week and we (and our friends) loved them. I made them with both variations of crust and they are just amazing. 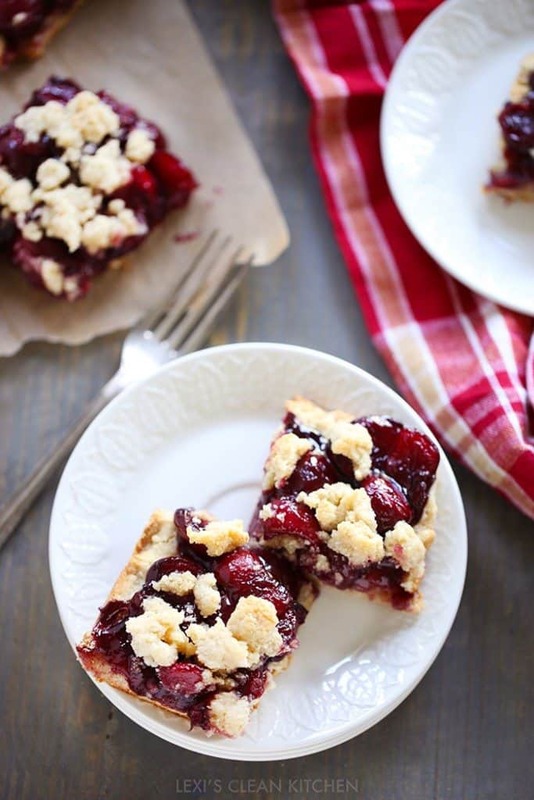 Go use those cherries and make them right now! Look at that crust and sweet goo-ey cherry pie filling. *I've made these both ways. The butter makes it more like a shortbread flavor, whereas the coconut oil has a slightly different taste. Both great. I am so excited that you are making a recipe and would love to see how it turns out! Make sure to use the hashtag on social media! subscribe to the email list! These look delicious! I can’t wait to make them this weekend 🙂 What grass fed butter do you typically use? I am wondering if you used pie cherries or sweet cherries. They sure look good. This looks like a great recipe and I can’t wait to try it! I prefer blueberries so I’m wondering would it be 4c worth of blueberries I’d use or less? Lexi your blog is beautiful! And these look fantastically delicious! Can’t wait to try them! Palaside peaches are in right now! Wondering how you’d switch out the peaches for cherries. Are canned cherries successful? No more cherries here. 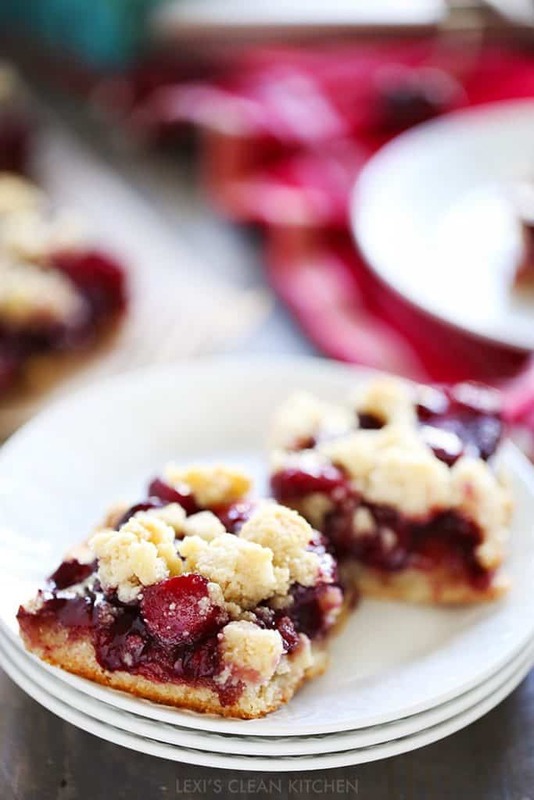 Just made these with frozen cherries cannot wait to try it. Let us know what you think! Enjoy! 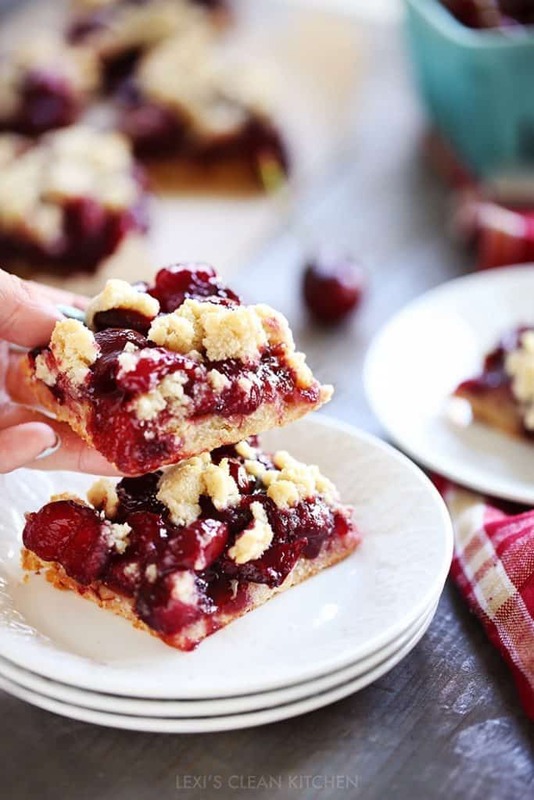 These Cherry Pie Bars look yummy! I would love to make these but unfortunately I cannot have almond flour (hyper-allergic to all tree nuts except coconuts). Do you have any recommendations as a replacement for the almond flour? This recipe sadly did not turn out! Something must be wrong with the list of ingredients for the crumble topping. The flour to butter ratio does not work for a crumble. Way too dry. The bottom crust is dry as well. The filling was great! Lynne, that’s really strange. Many people have had wonderful success with this recipe. Did yo follow it exactly? It gets rave reviews! No eggs in the crust? I’m allergic to almond and coconut flours (including almond butter). Makes my scalp totally inflamed. Is there an alternative for the flour where this would turn out well? I made this today and my family LOVED it! I mean, going on and on and saying it is the best dessert I’ve ever made good! Thank you so much for this recipe, I will definitely make it again and again. Hi Lexi, I love your recipes! I would like to make these soon but I’m all out of arrowroot. Do you think tapioca will work as a replacement in this case? I’ve seen them used interchangeably in lots of recipes but I’ve usually used arrowroot with fruit (like in cranberry sauce). Thanks!